Parks and Rec is also one of my Favorite Things. It took me a while to get hooked — the first two seasons are classic, albeit not at the caliber they achieved starting in Season 3, when Adam Scott and Rob Lowe became permanent cast members and helped the show really hit its stride. I credit Parks and Rec for reintroducing me to waffles. Of course I’d had them before, but for some reason I decided in my childhood that I didn’t like them. I think it was because we never remembered to take the butter out of the fridge early enough, so there would inevitably be a small group of waffle pockets filled with unspreadable butter, the rest of the pockets left dry and sad. It hurt my blossoming type A. Waffles were too high-maintenance. I had my parents’ divorce and early puberty to deal with — I didn’t have time to worry about proper buttering. So I stuck to pancakes with a side of self-loathing. Nowadays, life is pretty grand. I’m more willing to try new things — or in this case, re-try things I’d previously relegated to the “No” list, if the reasoning behind that designation has either disappeared or lessened in severity. I want waffles. All the time. I want to waffle-ize everything. This is very difficult, because I don’t possess a waffle-maker. Buying one is on my to-do list, along with cleaning out the closet (which will allow me to store said waffle-maker) and establishing a regular workout routine (because waffles). So, without further ado, I present the Reason Waffles Came Into My Life and I Will Therefore Be Forever Grateful to Parks and Rec. Leslie and Ron share a meal. Leslie asks, “Why would anyone ever eat anything besides breakfast food?” Ron replies: “People are idiots, Leslie.” A beautiful, illogical friendship blossoms. Waffles for the win. Several characters are hospitalized with the flu. Leslie breaks out and delivers an impassioned speech to the Chamber of Commerce, before hallucinating that someone’s face has gone all swirly and checking back in. Ben brings her waffles and homemade chicken soup. Of course she goes for the waffles. Ben and Leslie’s love for each other begins — with waffles. Leslie’s former best friend turned Eagleton snob, Lindsay Carlisle-Shay, claims that the only reason she travels into Pawnee to JJ’s Diner is because their waffles make great dog laxatives. But we all know the truth. Lindsay can’t get enough of them because they are perfect and delicious. Leslie writes a book about Pawnee, then experiences an existential crisis when she learns that she was actually born in Eagleton. She eventually comes to her senses and realizes that home is where the heart and the waffles are. They have a big book launch party, catered with — you guessed it — waffles. After Tom’s company goes bankrupt, Leslie takes him out for conciliatory waffles. Because waffles make everything better. Leslie visits Ben in Washington, D.C., while he’s there running a congressional campaign. She can barely hold in her excitement about the opportunity to meet political leaders, tour museums, and eat food truck waffles — not necessarily in that order. After the guys get food poisoning while sampling potential caterers’ fare for Ben and Leslie’s wedding, Ben has en epiphany and realizes that the ideal wedding caterer is obviously JJ’s Diner. WEDDING WAFFLES!!!!!! Naturally, they celebrate this momentous decision by eating waffles. Ben and Leslie decide to be spontaneous and get married on the night of a big fundraiser. Unfortunately, an outburst from Jeremy Jamm ruins that venue, but fear not — Leslie’s cohorts scramble and arrange an even better, intimate ceremony at City Hall. JJ is there, serving up the Wedding Waffles. I think I need to get married again, just for the Wedding Waffles. Season 5, Episode 22: Are You Better Off? This is a blink-and-you'll-miss-it moment of Side Waffle. Leslie’s upset because a group of citizens has organized a “Recall Leslie Knope” group in an effort to kick Leslie off of the city council. So naturally, she goes to JJ’s, because the only thing that can make you feel better when the whole town is turning against you and you’re about to get fired is waffles. Ann has to tell Leslie that she and Chris are moving away from Pawnee. What better tool to smooth things over than … DISTRACTION WAFFLES! It’s Ben and Leslie’s anniversary. So of course, they start their day with waffles. LOVE IS REAL. A rep from the National Park Service is in Pawnee, trying to convince Leslie to take a job with the federal government. They arrange a breakfast meeting at JJ’s, so that Leslie can throw her second “Questions About the Job” binder at him. Knowing it’ll be a long meeting, she tells Martha, the waitress, “I’m gonna need two hours’ worth of waffles.” A beautiful example of the old saying: When you’re thinking about changing jobs, waffles will point you in the right direction. Leslie is on the hunt for a new best friend, now that Ann has moved away. She decides that a classic pros and cons list comparison of all of her current girlfriends is the obvious answer in selecting her new bestie. She hosts an impromptu Galentine’s Day — it’s like Valentine’s Day, but with WAFFLES. In a classic sitcom fashion, Leslie thinks she just has the flu, but — surprise! except not surprise because this is SO cliché — she’s pregnant. She and Andy are on the road trying to secure a musical act for an upcoming festival when she takes the pregnancy test. They stop at a diner and she eats some Pregnancy Shock Waffles. Pawnee is growing and changing, and JJ’s Diner is in danger of closing, and Leslie goes on a mission to save it. (She’s just lost a bid to turn a large tract of land into a national park, so she’s looking for another just cause.) “They may have taken that land, but I will be damned if they take my waffles.” She organizes a protest rally outside the company that’s bought out JJ’s. PROTEST WAFFLES!! What do we want? Waffles! When do we want them? ALL THE TIME! After a night of way too much fun at Donna’s wedding, Leslie and Ben go to JJ’s for some Hangover Waffles and panic about the fact that the previous night, Ben drunk-dialed campaign manager extraordinaire Jen Barkley and agreed to run for Congress. On a trip to Washington, D.C., Leslie is so preoccupied by April’s announcement that she doesn't want to work for the government anymore that she accidentally eats Madeleine Albright’s waffle. Classic. In the series finale, we jump around between present day and the future, and we get to see how the character’s lives turn out. In one flash-forward scene, Ben surprises Leslie with a reunion party at the old Parks and Rec department at City Hall. Among the rest of the snack food, there’s a platter of waffles. Because Ben knows Leslie so well and as I said before LOVE IS REAL. So there you have it. 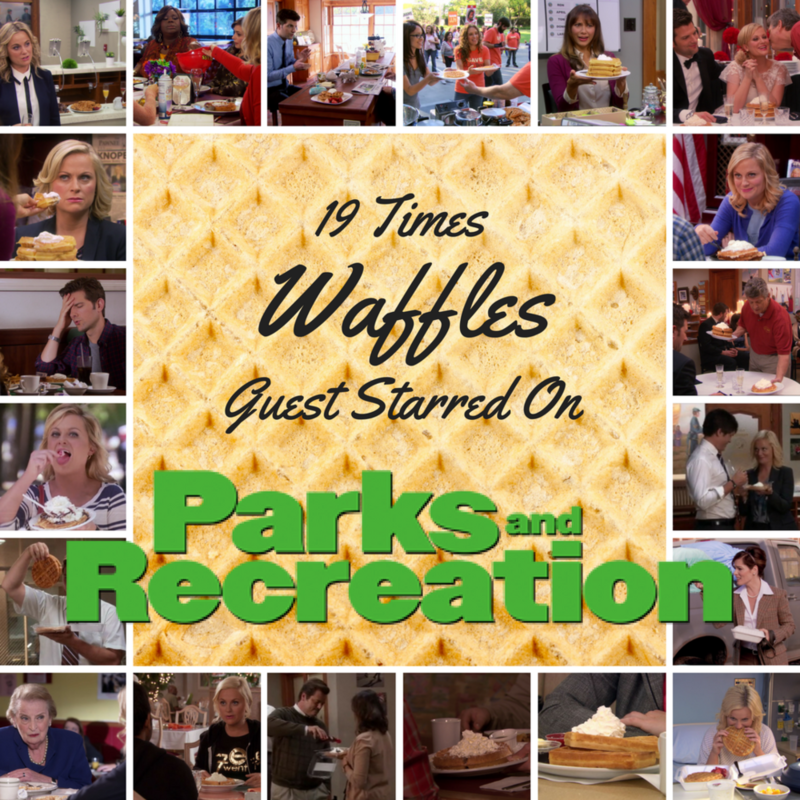 Nineteen delicious instances of waffles gracing our television screen and stealing the show in their syrupy, crunchy way. Now if you’ll excuse me, I’m gonna go Park myself in a diner booth and Rec a plateful of waffles.